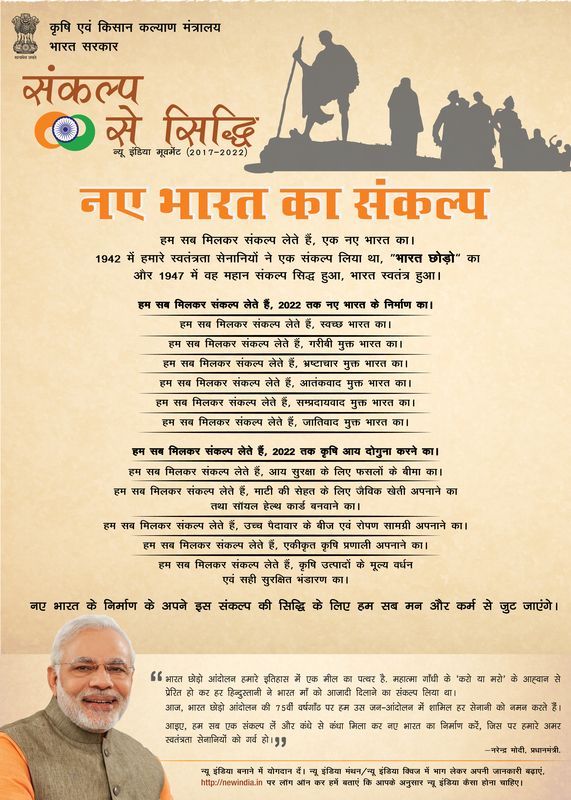 Objective: Doubling the income of the farmers Naye Bharat ka Nirman - Sankalp Se Siddhi Hum Sab Man aur Karm se Jut Jaye. Program was started at 11. am with registration and Welcome, in Krishak goshthi lectures delivered by scientists, experts and Govt. officers on the adoption of new technologies like seed production, sowing of low water requirement crops like pulses, oilseeds, vegetables, citrus fruits plantations, micro irrigation, goat, poultry rearing, animal husbandry, organic farming, value addition, food processing, market facilities, various Govt, schemes running for the welfare of the farmers for doubling the income. showing of video film, sankalp ceremony by hon,ble M.P. Saheb and end with vote of thanks given by KVK In Charge at 5.30 pm. Image: Sankalp se siddhi program at KVK, Mahoba, U.P.